When Morgan initially reached out, I immediately wanted to document their elopement! First of all: I'm a huge sucker for intimate weddings, especially when the backdrop ends up being the Sierra Buttes. Second of all: they sounded incredibly cool. They met in a pub in South Korea (7 years ago), so I was instantly drawn in to their connection, stories and travels. She even gave me solid advice on teaching internationally, which Morgan and Matt have done a lot of. Browse some favorite images below and enjoy a peak of their elopement! Morgan and Matt had an intimate engagement. He proposed a random Monday morning as she was getting ready for an interview. What were your favorite moments from the wedding? Future goals include: gardening, traveling more and family vacations! Morgan & Matt: Thank you for letting me document your elopement. It was beautiful. 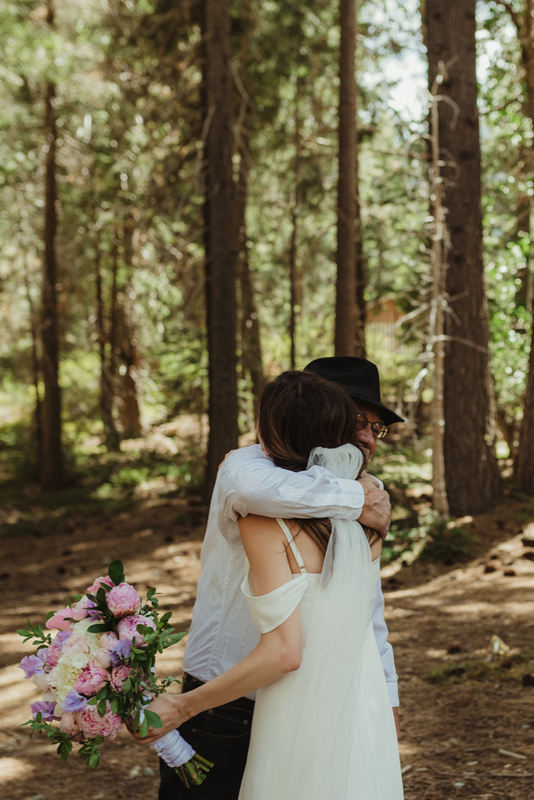 Elopement Location: Sardine Lake: Near Sierra City, California (North Yuba River). Tip from bride for future couples who are planning an elopement: Rehearse your intimate wedding like you would a regular wedding, so everyone is well directed and ready for the big day!